STR Vision CPM allows you to manage a project timings and resources, whilst demonstrating the progress of the scheduled construction activities directly on your screen. 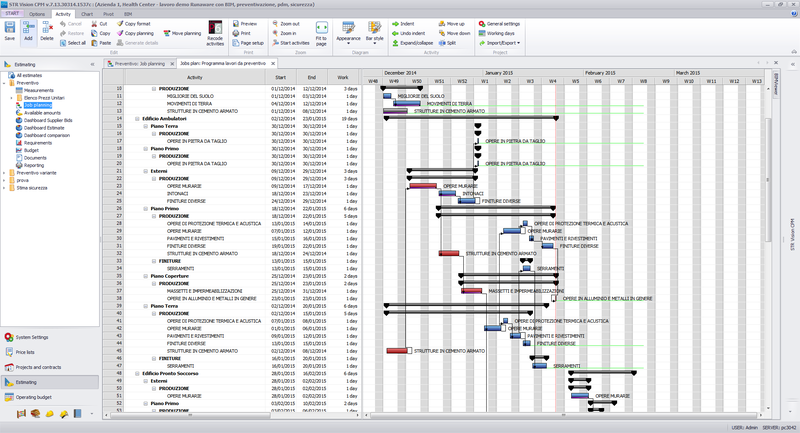 With the powerful virtual IFC Viewer, the Gantt chart for construction and working breakdown structure management you are able to assess the impact of the proposed design and monitor the network of events that may occur during the execution phase. STR Vision CPM is a construction scheduling software, which shows the critical path on which each event is linked to the following activities. Each activity is represented as a node on the network, and connecting lines are drawn to represent the time schedule to complete that activity. The activities are linked to the estimate and you may determine the sequence, you may connect and create a network of activities, to enter the completion time for every single activity and to identify the critical path to complete all of them. The IFC Viewer allows you to play the virtual simulation of the critical path, showing the sequence, and you can move back and forth in time and export the video file of your project. Moreover, STR Vision CPM guarantees a high level of interoperability (import/export) with other major software used for planning & scheduling such us Microsoft Project, Oracle Primavera and Synchro Pro.